A FIANNA FÁIL councillor has accused Renua of a “spectacular u-turn” over the party’s position on closing town councils. Jennifer Cuffe has accused Lucinda Creighton’s party of “hypocrisy” over proposals to reverse the government decision to abolish town councils. Cuffe, who’s running in the general election in Wicklow, made the comments after Renua said restoring town councils would be a “red line” issue for the party in government. 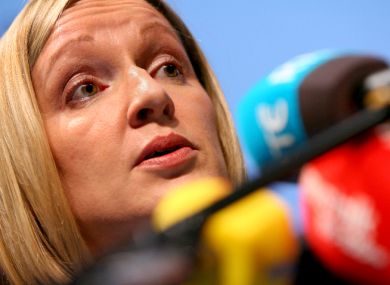 “Renua leader Lucinda Creighton says that the restoration of town councils would be a red line issue for the party. However a brief examination of the Dáil record shows that she was a vocal supporter of getting rid of them in the first place. What’s worse is the fact that Billy Timmins, Terence Flanagan and Paul Bradford were also vocal supporters of this mean-minded and short termist policy. In essence the entirety of the Renua party called for the abolition of town councils, and now that they realise how unpopular the decision was they have decided to do a spectacular u-turn. Cuffe said the abolition of town councils “led to a significant weakening of local democracy”. Creighton has hit back at the criticism. The former junior minister told TheJournal.ie: “It impossible for a party that did not exist ten months ago to have done a u-turn on a policy which it did not have until it launched its manifesto two weeks ago. It is a bizarre allegation which patently has no basis. I have long advocated the merging of the four Dublin authorities into one strong and efficient single authority with a directly elected mayor … My position is fully in line with the Renua proposal to introduce strong regional government. “This is in no way incompatible with the introduction of elected town and village councils. In fact this proposal will strengthen democracy at all levels,” Creighton said, adding that the party is proposing local councillors will be unpaid and will not receive expenses. Timmins, meanwhile, said Cuffe “clearly … hasn’t read our manifesto where we outline that each area or town should have the opportunity to have an input into matters that impact on its community”. “The model would be based on one similar to Blessington Forum, which is a group of elected/nominated local people who operate in an non-partisan manner,” Timmins stated. Email “War of words between Lucinda and councillor over 'spectacular u-turn' ”. Feedback on “War of words between Lucinda and councillor over 'spectacular u-turn' ”.